Whilst seeking out a record deal they briefly changed name to Fashion Prick, however Spiegelei suggested they use a more sensible name. Thus Brainstorm was born. Yet they still attempted to shock with their debut album SMILE A WHILE, which caused such a scandal due to its outrageous cover, was apparently withdrawn from sale at some stores! The music on both original Brainstorm albums was a highly inventive blend of songs and instrumentals, with nods to Zappa and Canterbury (Caravan, Hatfield & The North, Soft Machine, etc.) styles, fused into a music that was all of their own. Highlighted by quality musicianship, notably a dizzying array of winds and keyboards, with complexly arranged instrumentals and, like the Dutch band Supersister, a penchant for eccentric tongue-in-cheek humour. Brainstorm lived up to their name, delivering two albums that are classics of the genre, SMILE A WHILE more free-wheeling jazzy and happy-go-lucky, and SECOND SMILE more conceptual and concise, with a sublime air of satire on some tracks. Its tighter rock base was obviously due to the addition of Enno Dernov (bass) ex-Violence Fog and Jud's Gallery. 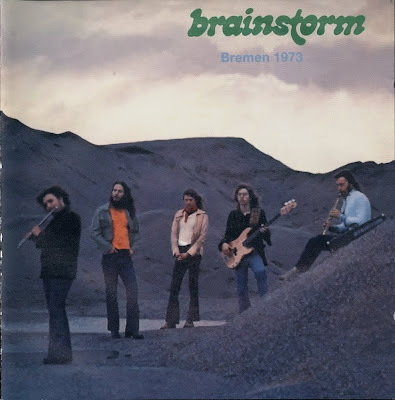 The creative live sound of Brainstorm is captured on the BREMEN 1973 CD, and it documents just how much fun their gigs were, and displays their superb musicianship, that is despite some dodgy vocal bits, which are inevitable! There was rumour of a third unreleased album, but we now know that it never happened, as after the departure of Jo Koinzer (replaced by Horst Mittmann) the band gradually fell to bits. Some new material, that obviously would have been on a third, can now be heard on the LAST SMILE live CD which documents a gig from WDR's "Nachtmusik" (6th April 1974), and features two unique works: "Signed" a jazzy groove feeling a little like Sweet Smoke, and "Stars On The Stage" which hints at the eccentric cabaret that Roland Schaeffer took with him into Guru Guru. Roland Schaeffer joined Guru Guru on TANGO FANGO (he also went on to play with Embryo and solo). In their later days (1974-1976) Rich Schwab used Brainstorm as a stepping stone between Eiliff and Schröder Roadshow! Joachim Koinzer has fronted numerous fusion bands since, the most notable being Orexis.